*Tagline, "I am Spartacus!" has been referenced in many movies, TV shows, and comedy sketches. Jonesy: The problem with historical epics is unless you're into history, it takes a very special historical epic to be a crowd pleaser. The last one I can honestly remember was GLADIATOR, though I don't care for the movie, but this isn't the time to get into that conversation. Roman history can be a difficult monster to tackle for the big screen because there are so many layers to every story: politics, betrayal, greed, war, and love. 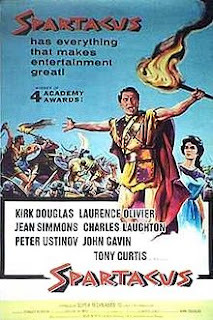 SPARTACUS tells the story of a slave who basically has had enough of the system and starts an uprising in Rome. There are other political subplots the movie touches on briefly including competing senators and the eventual rise of Julius Caesar. Those, for me, are actually a lot more interesting than the main story, but the script doesn't give those ample time to explore. (Side note...seriously though, Roman politics are absolutely insane. If you ever get a chance just to study it a little bit, you'll be glad our system is the way it is). And the fact the script didn't give ample time to other plots says something considering this movie is over three hours. Unfortunately, the pacing is pretty awful for most of the movie. The film could go through a serious editing to really hone in everything. What actually blew me away was that this was directed by Stanley Kubrick. Not that he couldn't direct a movie of this magnitude, but that I didn't notice any of his "touches". In fact, if I didn't read his name on the credits, I'm not sure I would have believed it. But I read some more about this movie, and it turns out there were other hands in the pot during film making, even though he was credited as director. The performances by the actors were what kept me invested. Kurt Douglas has a commanding presence on screen, and he felt like the grandfather of all the other epic film leaders we've seen in the modern day, like Gibson and Crowe. However, Peter Ustinov, as the slave owner Batiatus, absolutely stole the screen every scene he was in. Ustinov gave Batiatus a smarmy, almost caricature-like pompous persona that made me giggle. A grand film like this is a great example of the intricacies that go into set design, costuming, and filming logistics. Wrapping my head around the energy and planning that would go into any of those jobs gives me a headache. Other than some interesting characters and some gorgeous technical aspects, SPARTACUS is just a tad too boring to sit through again. I'm not going to lie guys... I kind of really didn't like this movie. I tried to. 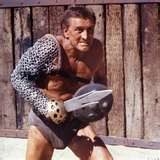 We've all heard the whole "I am Spartacus" scene, but I never really bothered to check it out until I had to do the review for this column. I thought that the movie was horribly long without needing to be. The themes that the movie was trying to get across have been done better in other films. It was well acted, and just like BEN-HUR before it, it has beautiful sets and costume designs. But it's just not worth the time that you're investing in it. Let's go into the positive before I go basically in a glorified rant of this movie. I actually enjoyed the acting. Kirk Douglas plays the honorable hero character really well. Whenever he makes speeches, you feel the weight of his words and you know you're witnessing something special. There are many people that have tried to play this sort of heroic character, and Douglas is one that is really good at it. Jean Simmons as Varinia, the love interest, has good chemistry with Douglas and makes the slightly more believable. To be fair, she really doesn't have much to do seeing as it's mostly her being sad and looking longingly into Spartacus' eyes. What really impressed me was the props and the costume design. I mean this definitely feels like a lived-in, if a little fantasized, version of ancient Rome. The scope of the sets and the attention to detail makes me believe that they took as much care about the background characters as they did with those of the main characters. My big problem with the movie is the pacing. I can't express the annoyance that I had with it. I know that we have a collectively diminished attention span. But here's my thing, I NEVER have a problem with a long movie, but it has to earn the run time. To me there is ZERO excuse to have a three hour movie when there are numerous montage scenes in the first hour and half before the intermission and have absolutely NOTHING happen by then. By the time that you get to the second part of the movie when the climactic battle happens, they spend more time setting it up than actually fighting. What's worse is after the battle is done, all of the plot lines are resolved so quickly that for once the movie felt rushed. The big themes of the movie, such as freedom and the fact that it's an idea that cannot be killed, have been handled so much better in order instances than just through a clumsy line uttered by Crassus towards the end of the film. For those that have not seen it, I won't spoil it, but The Reichenbach Fall from the second season of SHERLOCK handled this spectacularly. Like I said, it's themes were just done some clumsily, I couldn't take them seriously. I have other issues with the morality of the slaves, where they are seen looting and taking gold from citizens, but for the sake of this column, I'll hold off on that. Either way, I loved BEN-HUR way more than this movie. I'm questioning exactly why it's higher than some of the movies we've seen, but we will probably encounter this more often.